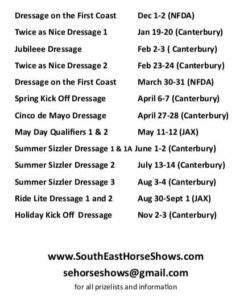 The 2019 USEF/USDF dressage tests are effective for four years beginning December 1, 2018. Click right here to see them. And here to read Bill’s take on them. My friend thinks her circles are round. How can I convince her they are not? Then it’s time for the ultimate slap upside the head. You will need the following props: the rider’s horse all tacked up and ready to be ridden normally, four traffic cones, a flat area large enough that you can mark the four corners of a 20 meter square with excess room on the outside all around it, and a lunge line. Now mark off the length of exactly 10 meters on the line. You will stand at the exact center of the square and pivot on that point, never being drawn off it. 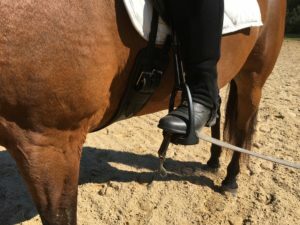 Take the opposite end of the line and — without fastening it to the horse or the rider – place it on the tread of the stirrup under the rider’s inside boot. She should press down on it enough with the ball of her foot to hold the end of the line in place. Have her simply ride a succession of correct 20 meter circles inscribed in that square. Retain your spot at all costs, keep the line the same length, and continue facing her as she turns around you. The rider does the steering. If her horse falls in, the line droops and becomes slack. 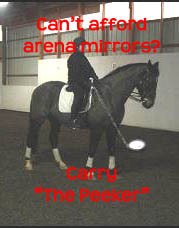 If her horse bulges out, the line will pull her inside leg away from the horse’s side. It’s an immediate (and mildly embarrassing) way to discover how unround supposedly “round” circles can be! ALL THE PAST QUESTIONS OF THE MONTH–NOW 100 OF THEM– AND BILL’S ANSWERS AWAIT IF YOU CLICK HERE TO ACCESS THE QOTM ARCHIVES. BILL’s On-Line Store — STORECRAZY — is here to provide you with items that Dover and John Nunn can’t offer. Here’s a quick sample. CLICK HERE to find many more items you won’t want to live without! When all else fails, go to the mirror! But regardless, DO pay attention to the man behind the curtain. 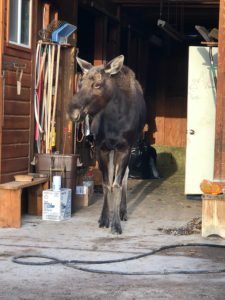 Liz Hirschland, Bill’s Wyoming friend and student, was recently shocked when this emerged from her open barn one frosty morning!! Liz, meanwhile, is recuperating from double knee replacements and has our very best wishes. Bill Woods (not his real name) comes to the Dallas area several times a year. 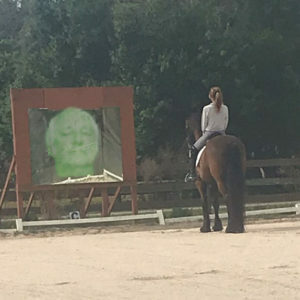 He and his wife, Onyx, are members of the Federal Dressage Witness Protection Program; thus, their true place of residence is unknown. Both train and compete most of the year in central Florida, often in disguise. Bill has been teaching in Texas since the mid ‘80s, having been brought here by Lisa Brown.They had met in New Hampshire some years before, drawn together by a mutual love of hybrid roses which they tended on summer afternoons at the institution. 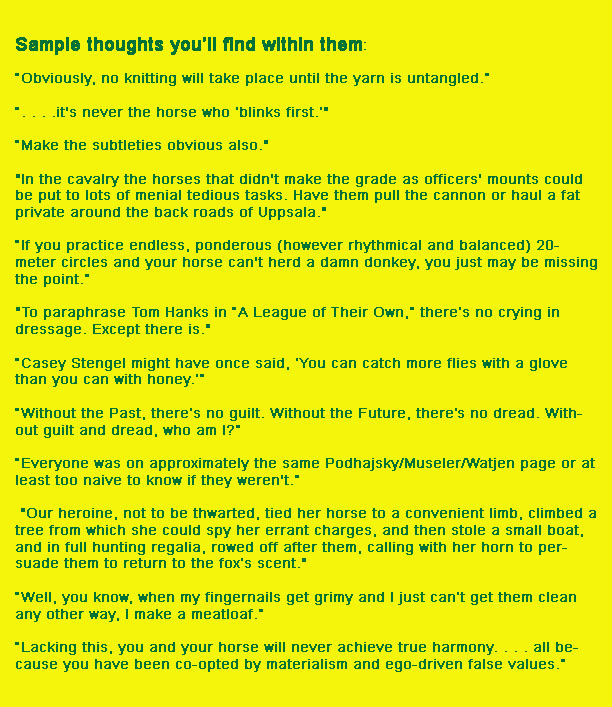 If any of the following snippets pique your curiosity, you can find the story archived on this site. 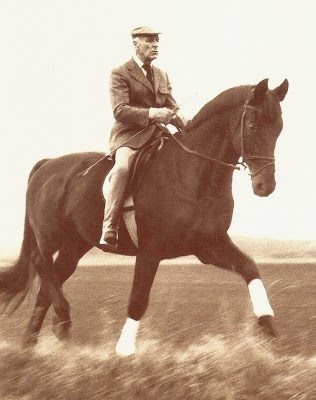 It’s DRESSAGE Unscrambled, with a twist—it’s free! More than two dozen dozen (more than 330) posts accessed by this click. Remember Reiner Klimke and Ahlerich in the victory lap after their gold medal win at the ’84 LA Olympics? All those 76 one tempis in a row? Well, for old time’s sake, click here for the instant replay! 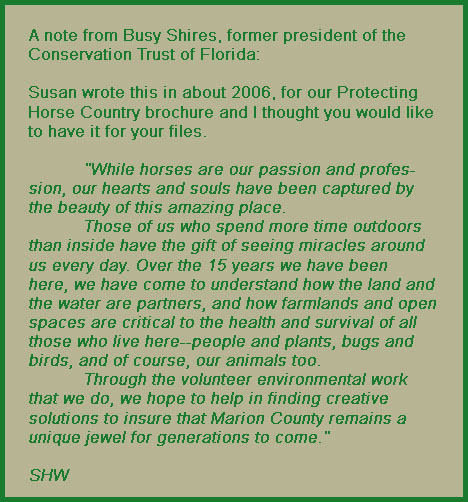 The Horse Protection Association of Florida needs your help! HPAF receives no state or federal funding and exists only through donations. The amount of neglected horses and horses whose owners can no longer afford to feed them has exploded recently and your donations make it possible for HPAF to continue the work of protecting and saving horses. LIFE GETTING YOU DOWN? THIS, TOO, SHALL PASS CLICK HERE FOR RELIEF OK, GO! FEAST YOUR EYES ON THIS — A FANCIFUL VIDEO MONTAGE TO LEONARD COHEN’S “DANCE ME TO THE END OF LOVE.” The tango sequence is from the 1992 film Scent of a Woman. 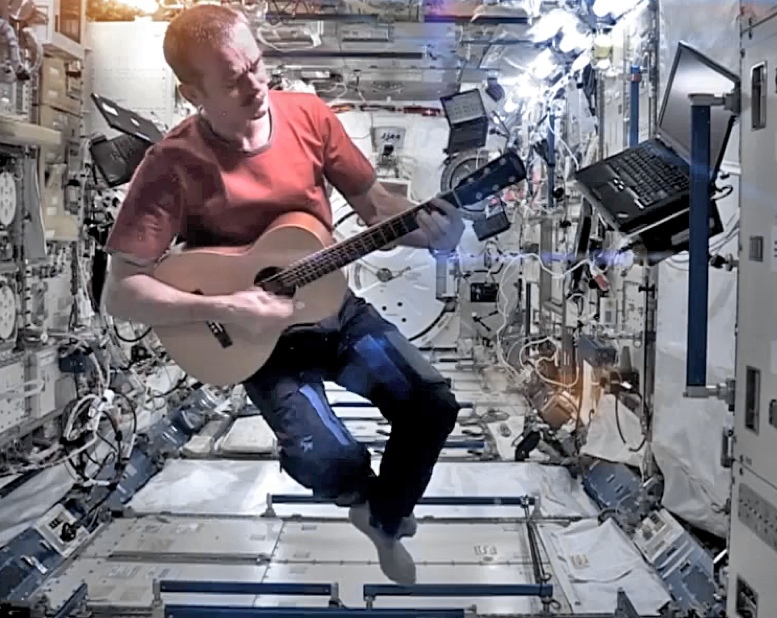 HAVE YOU BEEN TO SHOW BILL YET? Below: To imprint in your mind. Harmony in the person of Col. Kurt Albrecht von Ziegner. His mount unknown. Carl Sagan speaks of The Pale Blue Dot. Please click below and watch this! If this August’s total eclipse of the sun worked for you (or if you were indoors at the movies), there’s a second showing. The date will be April 8, 2024. Visible in the US on a swath from Texas through parts of the Midwest to Buffalo. I am not going to miss it! 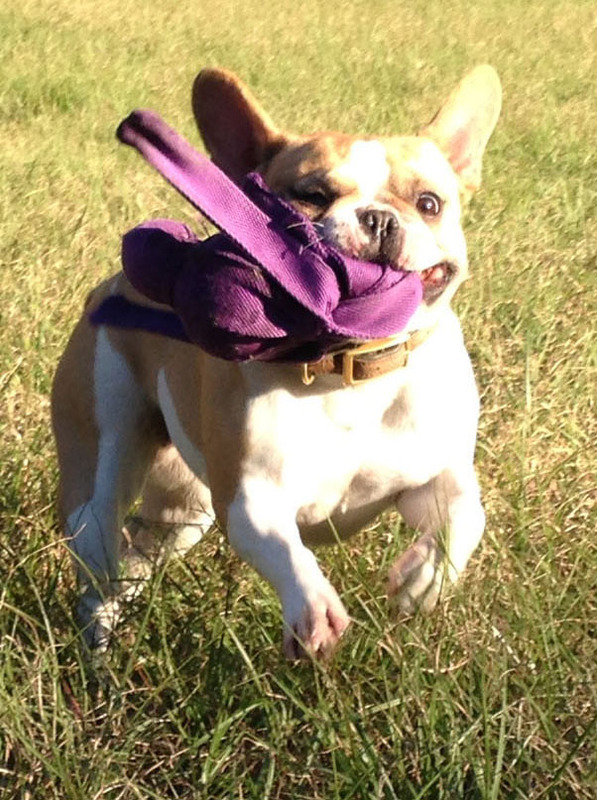 TUNY [photo], the French Bulldog , sadly crossed the rainbow bridge in November. 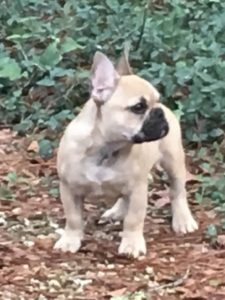 Her position as the official Safety Coordinator of this website has been passed along to Alan, the new Frenchie puppy. He has been getting up to speed on the Manual. If as you’re reading, he issues the “Duck and Cover” instruction, please climb under your desk and assume the position until he issues her All Clear announcement. While Alan [below] may appear to be very youthful for these responsibilities, he has assumed the mantle and hopes to grow old as he carries out his duties.